As you search for information about order picking carts on the Internet, most will provide only one or two benefits in any detail. To get the full scope of benefits, you will take more time to conduct searches, which is unnecessary and unproductive downtime. Unproductive downtime has been and remains a very real concern for companies that are involved in manufacturing, warehousing, and distribution operations. You might be taking for granted one simple addition, order picking carts, which can translate into a variety of benefits and savings and dramatically improve the accuracy and efficiency of your warehouse. Did you know that unproductive downtime, including time lost that can't be measured or tracked (also known as hidden downtime), can easily exceed thousands of hours in one year's time? The right order picking carts can significantly reduce that downtime and save your company time and money that you may not have been aware you were losing. 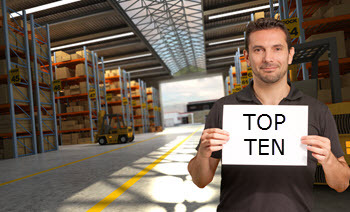 Here are the TOP TEN reasons a warehouse is worthless without the right order picking carts. Reduction of time lost with accounting for the movement of employees from a stationary workstation to different areas of your warehouse as they pick orders. Mobile order picking carts can reduce employee fatigue and decrease work-related stress, which translates into improved morale and a more positive work environment. Happy employees are not only more productive but they are less likely to contribute to your company's turnover rate, which in turn reduces the cost associated with the hiring and training of new staff. Employees are using order picking carts with computer workstations on board, which allows the computerized data to travel with the employee and enables order data to be updated in real time. This provides employees with an up-to-the-minute report on order fulfillment, including any recent changes made to the order, which increases the efficiency and accuracy of the picks being performed. Portable order picking carts are ideal for companies that don't have a great deal of space allotted for cubicles and offices. More space can be used for warehouse operations. The compact design of portable order picking carts is a space saver and they can easily be moved and stored at any spot in your facility. If you upgrade or outgrow your existing facility, these carts can also be transported to your new location with minimal fuss and be ready to use in a short time, which reduces downtime lost due to relocation of your operations. Since order data is updated in real time, these carts allow multiple employees to pick for one order without duplicating each other's efforts. Order picking carts are completely adaptable and scalable to a business of any size or order volume, and you can easily grow your "fleet" of carts as your business grows. The carts can be integrated into existing operations that have partially automated order picking systems. Whether you use robots, conveyors, or other machinery, the inclusion of order picking carts can enhance and streamline your current system rather than requiring an overhaul of your entire operation. As with integration into your physical operations, order picking carts can also be integrated with your existing data assets, software, or applications. The order picking carts can be interfaced with receiving operations to provide immediate updates to your on-hand inventory counts or used to improve the efficiency and accuracy of your physical inventories and decrease loss attributed to inaccurate counts. By reducing the need for stationary workspaces and furnishings, you are also taking steps toward creating a workplace that embraces lean manufacturing. As new staff learn quickly, the process actually involves several different components and the overall system is in reality quite complex. Minor errors can translate into mis-picked orders, delays in fulfillment, an inability to meet deadlines, lost customers, and lost revenue, not to mention the damage to a business reputation. Improving the order picking process with the latest technology includes order picking carts with portable power packs. Scanners, printers, laptops, computer screens can all be powered on the order picking cart which makes it a powered workstation. While the warehouse is worthless without order picking carts, the new carts with portable power improves efficiencies and accuracies.